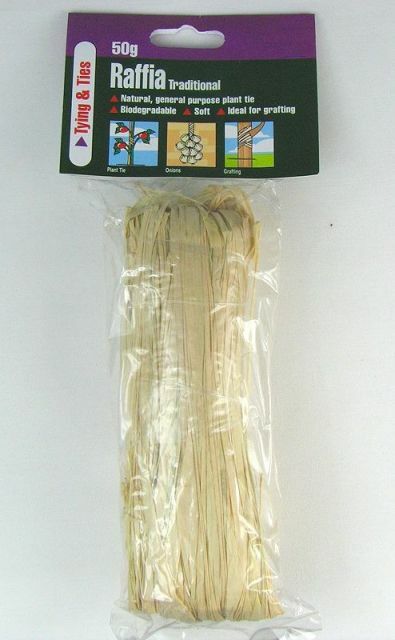 RAKE - Small rake used in BONSAI>BONSAI for clearing soilaround nebari or tree ROOTS (during REPOTTING). 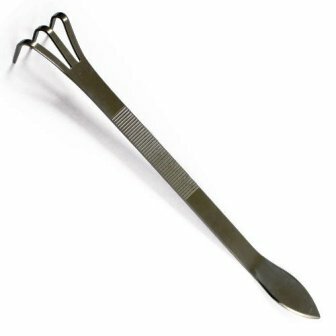 Usually combined with either TWEEZERS or a SPATULA at the other end of the tool. (Send Image) Red SPIDER MITE - There are two types : the FRUIT tree RED SPIDER MITE on broad-leaved trees and the conifer spinning mite on conifers. Indications of infection are an unhealthy browning of the foliage accompanied by a silky webbing. Tiny spider-like mites may also be seen on leaf undersides. 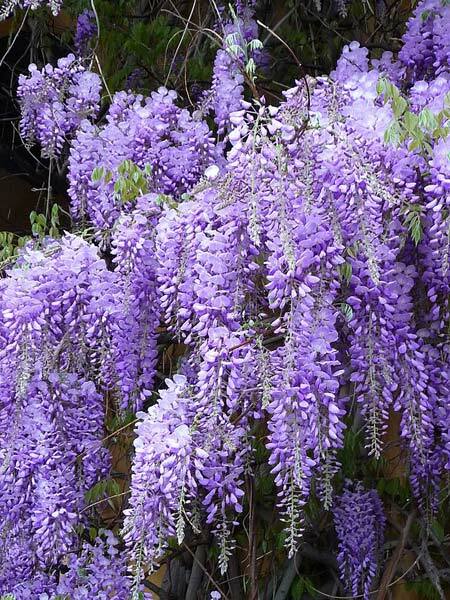 These can cause serious damage and should be sprayed with insecticide - ideally MALATHION or DERRIS. Alternative type is the Glasshouse Red Spider Mite or "Web-forming Tetranychus". (Send Image) RED SPOT DISEASE - This is a disease of maples which is triggered by a fungal attack causing brilliant red "pimples" to appear on the BARK. Initially the bark, and then the whole branch dies back. The only known treatment is to prune back to healthy wood. (Send Image) REDUCTION BUILDING - This process uses accelerated growth techniques and massive foliage and branch reduction, followed by strong re-growth, more moderate reduction and training (primarily by training). 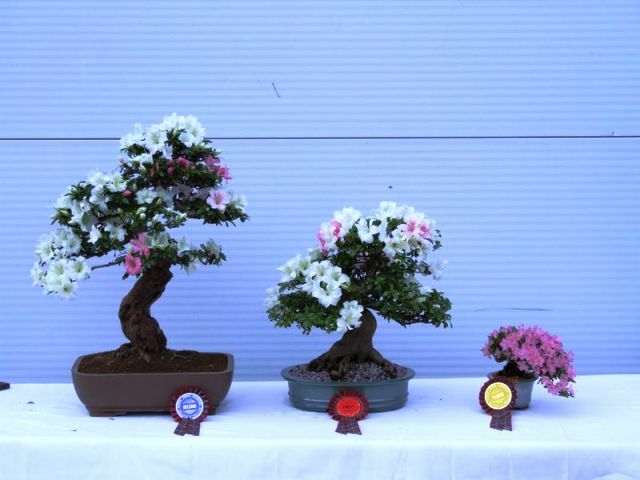 It is used to produce larger trunks with character and TAPER, particularly in TROPICAL regions but may be applied in temperate regions to SPECIES like aZAleas. REDWOOD - CALIFORNIA (SEQUOIA SEMPERVIRENS) - Very tall EVERGREEN conifer with a columnar outline and drooping lower branches. 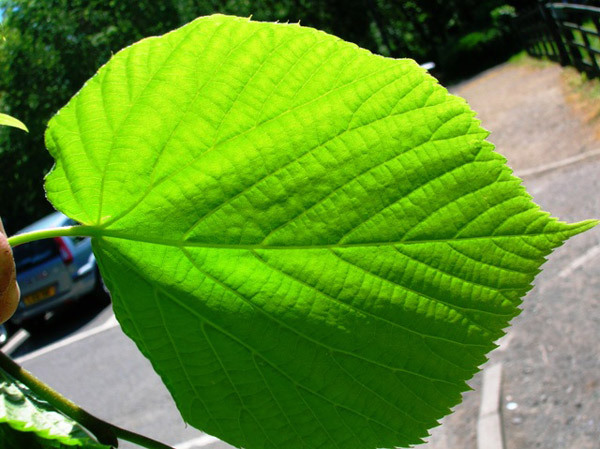 It has attractive, red/brown fibrous BARK and flattened, NEEDLE-like LEAVES which are mid-green and curved on main SHOOTS and dark green, flat and narrow on lateral ones. RENIFORM (LEAF) - Kidney SHAPEd with stem attached at concave edge. REPOTTING - The ROOTS of potted trees are limited by the size of their container as to how far they can spread. After a period of time which varies dependant on the SPECIES of tree, the root systems of all pot-grown trees fill their containers, eventually becoming 'POT BOUND' and in some cases they begin to push the tree out of the pot. 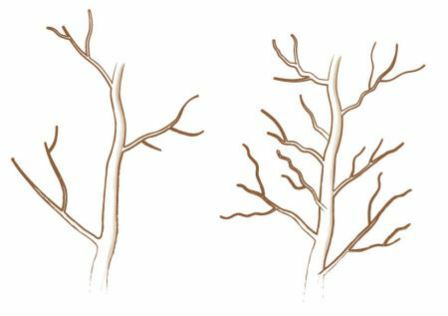 When this happens the fine FEEDER ROOTS that are essential to the uptake of water and nutrients have little room to grow, are far away from the main TRUNK OF THE TREE, the soil structure deteriorates and the plant starts to suffer. 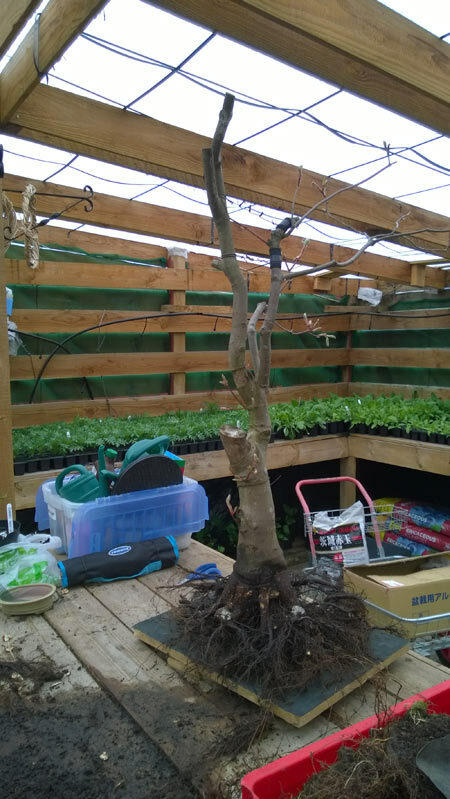 At this point repotting is required to allow fresh COMPOST/potting medium/substrate to be inserted in and around the root system and the root sytem itself may require CUTTING back so that it can continue to form fine feeder roots closer to the trunk. (Send Image) OSMOSIS>REVERSE OSMOSIS - The passage of water from the ROOTS into the soil. 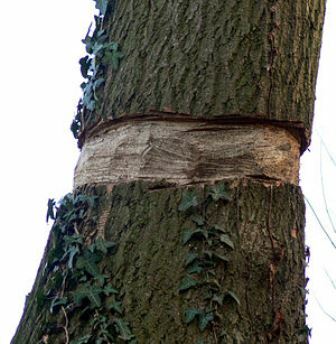 This is often caused by an excessive concentration of fertilizer in the soil and can result in browning of foliage and , in extreme, untreated cases, the death of the tree. 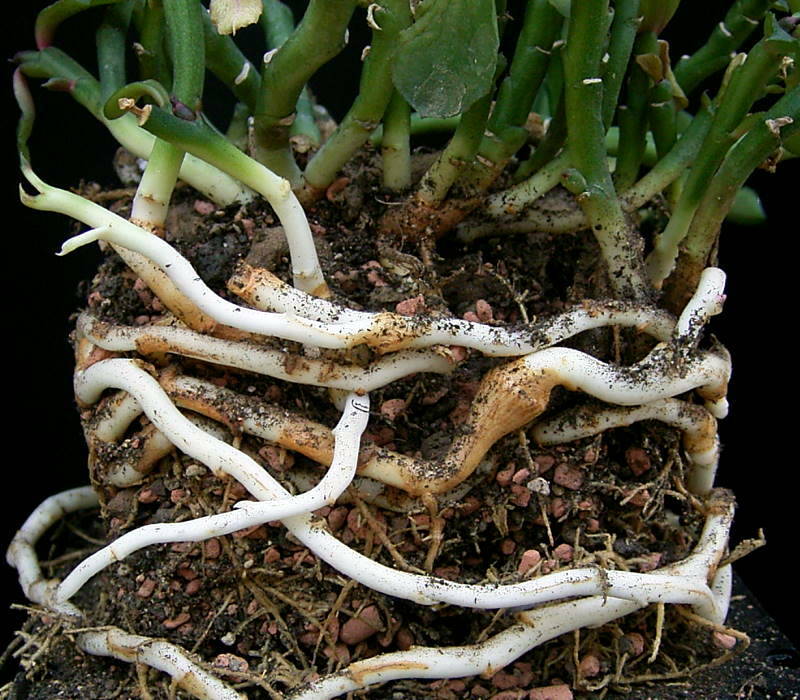 RHIZOME - This is a continuously growing horizontal underground stem which puts out lateral SHOOTS and adventitious ROOTS at intervals. Rhododendron (AZAlea) - See AZALEA (RHODODENDRON) . RHOMBOID (LEAF) - Diamond SHAPEd.